So I was standing at my kitchen window looking out and I spied some tiny Muscari flowers framed beautifully against an old wooden sleeper. For my background I used Crumb Cake ink and the large Hardwood stamp. 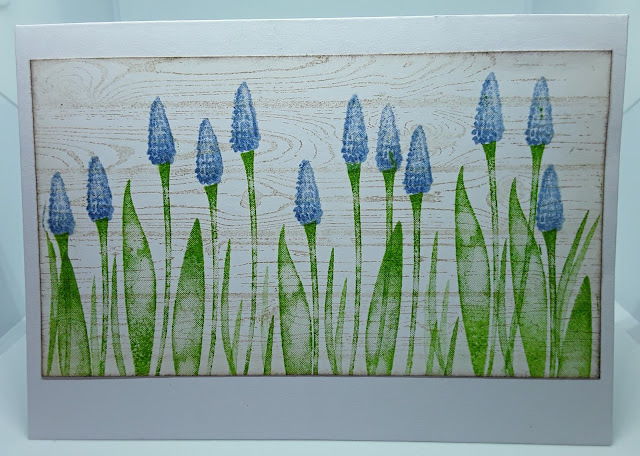 I then used the Tranquil Tulips set and the little stamps from that to create my Muscari. There are lots of leaves and spikey grass bits to use too. It's a very clean and simple card and I may add a sentiment later or I may just leave it as it is.